I've been hearing that dystopian books are no longer popular. I still like to read them and as long as these types of books are published, I'm sure they'll find their way to readers. We are featuring such a novel today and it's a Young Adult book. We are today's stop on the First blog tour hosted by Red Adept Publishing. Find the official tour page here. Our stop is jam-packed with an excerpt, a guest post by the author, our review and a giveaway. Seventeen-year-old Mira works on a farm in the ruins of Texas, along with all of the other descendants of the defeated rebels. Though she’s given her heart to Tanner, their lives are not their own. When Socrates, a powerful First, chooses Mira as his Second, she is thrust into the bewildering world of the rich and influential. Will, a servant assigned to assist her, whispers of rebellion, love, and of a darker fate than she’s ever imagined. With time running out, Mira must decide whether to run to the boy she left behind, the boy who wants her to live, or the man who wants her dead. I’ve read a lot of books. Both my shelves and my Kindle are full of the things. From romance to science fiction, I have my own library. But across the new books I’ve picked up most recently, however, I’ve started seeing a rather disturbing trend. At this point, I usually stop reading and chuck the book across the room. It seems to me it’s becoming a modern trend in literature for naïve, helpless girls to fall for some over demanding, emotionally or physically abusive jerk who makes her feel horrible and dependent on him, completely unable to take care of herself without his “loving” touch. What I can’t figure out is why this is so popular, especially in young adult. When I was growing up, there wasn’t much of a young adult genre. There were kid’s books, what we’d probably now classify as middle grade, and then adult books. Most of those books were also pretty tame by today’s standards, where anything goes, it seems. I don’t remember reading any book growing up that had an abusive romantic interest or a female main character who justified her attraction to a character like that because it is obviously true love. My book, First, has two love interests for the main character, Mira. One of them, Tanner, is the all-American boy next door. He grew up with Mira, loves her, and tries to protect her. He’s pretty straight forward and wears his emotions on his sleeve. The other young man, Will, is more mysterious. He has a darker side. You don’t quite know what his true motivations are, but he’d also never hurt Mira. It’s just not in either of their natures. Her relationships with these young men progress at their own paces, but it’s not that instant jump-off-a-cliff kind of attraction I’ve seen in other books. Maybe it’s just me and people are into that sort of thing these days. Perhaps I’m a prude, too. It wouldn’t be the worst thing I’ve ever been called. I enjoy reading and writing about female characters who want real partners who will help them grow, not tear them down. If he happens to be a good kisser, though, that certainly doesn’t hurt. The room smells musty, unused. Kind of like the back storage buildings on the farm, or the old cellar the Chesanings don’t use any more where we explore and play games. Shafts of sunlight slant through the cracks in the heavy, dark red curtains, and when I take a step, more puffs of dust cloud the air. Chairs covered in white blankets line the walls and tower over me in stacks almost as high as the ceiling. “What do you think they’re doing out there?” I whisper, but it’s so quiet, I could be shouting. “Did I do something wrong? Did I make Thoreau mad?” I bite my lip to keep it from trembling. Grow up, Adrian. Stop acting like a baby. “No, of course not.” He flashes me a quick grin, but I can tell he’s nervous. “Are you sure?” I hate it when my voice is all shaky like a little baby’s. On the other side of the door, I hear clapping. An old man’s voice rises up as the applause dies. “There, you see?” Will says. “Nothing to worry about.” I turn away and tune him out so I can listen to Thoreau. A dull roar follows his words, and I fidget in my seat, watching the door. My eyes dart to Will. A loud boom shakes the room, and I almost fall down. The chairs weave back and forth in their towers, and millions of dust particles rain down. Will shoves me away from the wall and pushes me toward the back of the room. “Move, now!” he shouts, but my ears are ringing, and I cough from the dust. He looks behind us at the door and forces me to move faster. There’s more yelling, but I can’t make out what they’re saying. Another, quieter boom. Will pushes me to a narrow closet. “In here,” he hisses and shoves me inside. We stay like that for what feels like a couple hours before the door to our main room bangs open, and I hear the heavy clomping of boots. Apparently these are magic words for Will because relief washes over his features. “Papa bird.” The men march over to our closet and slide open the door. “Good spot, boy.” The head guard, an older man with a pinched face and a permanent frown sheaths his Artos. The other guards keep theirs out. Why? Is it still dangerous? “What’s going on out there?” Will asks. “Nothing we didn’t expect. Stupid rebels, always doing things half-assed.” He grins. “Let’s go.” One of them reaches out for me, but I jerk away. “Someplace safe.” The head guard takes my arm roughly in his. “Don’t worry. We won’t let anything happen to you.” One of the other guards laughs, as if that’s somehow funny. “Nothing,” he answers too quickly. “Just a trip down to the medical center, to make sure you’re all right.” He tries to give me another smile, but he’s lying about something. I can feel it. 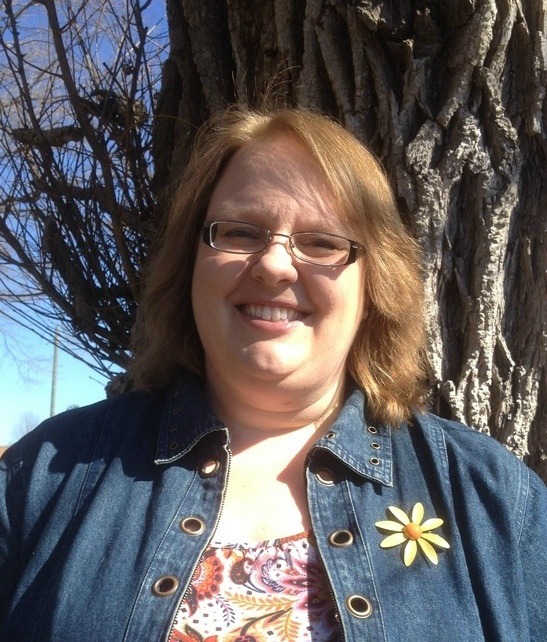 Chanda Stafford teaches middle and high school English. 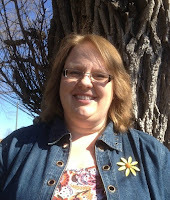 She loves traveling and currently lives in Michigan with her husband and a menagerie of rescued dogs and cats. When she’s not reading or writing, Chanda enjoys old zombie movies, authentic Italian food, and comic books. I attended a conference recently and heard once again that dystopian is no longer "in." Okay, I thought, since I was reading one on my Kindle that very day. All I know is I like the genre and if publishers and authors are going to make their stories available, I will read it if it interests me. First by Chanda Stafford is such a book. The futuristic world of First is nuanced. Told in dual points-of-view by a young girl, Mira, and a wiser, powerful older man, Socrates, we first see Mira at home. She lives in Texas, a state which declared war on the White House but lost the fight and they've been suffering the after effects for centuries. Mira, almost eighteen, lives on Chesaning Farms where residents sport barcodes and are made to work. When a First visits the farm, the kids are rounded up and put on display for this important man, Socrates. He has been seeking a Second to groom under him and Mira catches his eye. Mira doesn't want to be there in this selection process, she's weeks shy of turning eighteen and being 'too old' so she's there to support her younger brother, but her defiant stance catches the eye of Socrates and he picks her. Being chosen is a huge honor since the ancestors of the chosen one are absolved of their sins against the government. Mira isn't keen to leave her baby brother or Tanner, the boy she's grown up and obviously loves, but her mother is proud to have her daughter chosen. From then on this fast-paced story had me fully involved. A group seeking to destroy the Firsts and their governing hand, Live Once, gets involved, and we begin to see the type of man Socrates is. I know I was supposed to dislike Socrates but I couldn't. As for Mira, I liked her character. She's strong, defiant, yet knows when to keep her mouth shut. She's torn between two guys, her beloved Tanner or her enigmatic assistant, Will. There are murmurs of a rising revolt and Mira is torn between honoring her family or settling with her heart. The opening chapter involving Adrian begins to make sense as the story progresses. I thoroughly enjoyed First and found it hard to put down. Chanda Stafford has a way with words and she revealed the right amount to keep me guessing and my eyes riveted to the page. Occasionally, I can get lost in futuristic tales with its world building, politics and action. That did not happen here. The main characters were deftly created and I love when I have difficulty hating the antagonist. This futuristic world and its politics intrigued me and I will keep an eye out for the second book in this series. 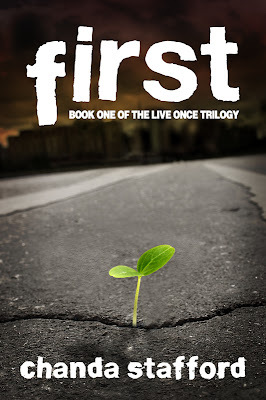 Entertaining, mysterious, romantic and involving, First is a dystopian fans need to know about. I'll admit when I first saw this cover I thought it was lame. After reading the book that little bud is symbolic of the story and it's cool. I received a promotional copy from the publisher in return for my honest review during a book tour. Thanks for reviewing my book and giving me the opportunity to write a guest post. I really appreciate it!